The Ayutthaya Grand Hotel is a delightful hotel where you will find all the comforts and facilities of an international hotel. A comprehensive range of meeting facilities as well as an impressive pool are provided. Rooms are clean at simple tourist standard with modern amenities and are suitable for those looking for good standard, budget accommodation. The Ayutthaya Grand provides 93 typical rooms, 11 junior suite and 18 executive suites. All rooms offers a panoramic view of this unique city. All typical rooms and suites are equipped with individually controlled air-conditioning, a private bathroom with hot & cold water and tub/shower, a mini-bar, refrigerator, radio, color television and international direct dial telephone services. Superior Rooms are 28-30 sqm with city or pool views and fitted with a double bed or 2 single beds. Bathrooms have a bathtub with an overhead shower. City or pool view rooms are subject to request and cannot be guaranteed. Deluxe Rooms are 45 sqm with city or pool views and fitted with a king size bed. 2 single beds are unavailable. Bathrooms have a bathtub with an overhead shower. City or pool view rooms are subject to request and cannot be guaranteed. 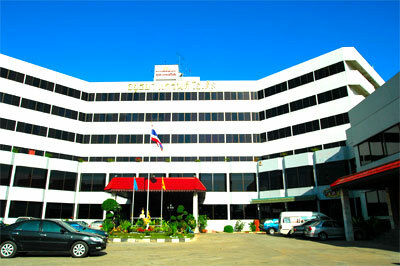 The Ayuthaya Grand Hotel is an ideal business and holiday as well as a perfect place for seminar and convention. Comprehensive range of entertainment, dining and meeting facilites is offered along with impressive swimming pool, sun decks. Expect to be greeted with the world-renowned Thai hospitality. All staff are well trained and ready to provide quick and efficient service. Additional Features: Barber & beauty shop, gift shop, facsimile service, safety deposit boxes, money exchange, laundry service and tourist information desk,Games room. A pleasure delight of its Coffee Shop, Cocktail Lounge and Night Club provide; dining, relaxing and enjoying the entertainments a complete the ideal of your holidays.